I don't really know yet how to play Levelhead, but it has GPL-ed code and CC-BY-SA-ed art assets. This means it's good, right? Right? Well, I'll try to find out whether or not you can play it without having to cut a LCD display in mouth-sized pieces first. There's news regarding Sandbox, the child-friendly Sauerbraten-based 3D game/engine/editor. A completely freely licensed version is in the works. (Code and media.) So, hopefully we'll have a release soon, which will be includable in Debian for example. I'm very interested in this project, as it's obvious aim is to make content/game-creation a child's play! 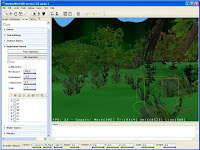 MonkeyWorld 3D is a BSD Licensed scene editor for the jMonkeyEngine which I found through a thread on Radakan's forums. Speaking of Radakan: There's some tasty new gui design and concept art going on. Cool, I searched for "open source" on flickr and found a new toy: The aurora open source mixer. It's specifications and driver appear to be CC-BY-licensed. I'm not sure if the license is well suitable for hardware, but it does make the device attractive. I wonder if I can get enough motivation to get my soldering iron out. A GNU/Linux driver seems to be missing. You don't have to cut up an LCD. The program uses a webcam pointed at a paper cube with markings on it, and displays the final image on the screen, ala eyetoy or that new PS3 pet thing they are making. I thought he was being sarcastic. It's been a little dry here for a while. New post coming soon? Levelhead needs to be compiled for windows, use any webcam, and with papercraft box.